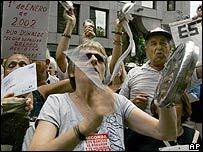 The Supreme Court in Argentina has ordered the country's banks to repay in full savings that were frozen during the economic crisis of 2001-02. The government had frozen US dollar accounts held by some 50,000 depositors then forcibly converted them to devalued pesos. The court upheld the government's right to issue that decree. 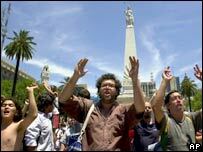 Its ruling gives savers the same amount in pesos their savings had been worth in dollars when the crisis ensued. With this ruling, the Supreme Court hopes to help lay to rest the years of anger and financial hardship caused by the economic crisis. At that time, investors were caught up in a series of government decisions. Firstly, it froze bank accounts and then forcibly converted any accounts held in dollars into devalued pesos. Until the financial crisis, Argentina had pegged its currency at a rate of one to one to the US dollar. In the midst of the economic meltdown, it dropped that peg; the Argentine peso went into freefall and eventually settled at about three pesos to the dollar. In other words, account holders lost two-thirds of their money and they have been campaigning ever since for its return. In their ruling, the justices say those dollar account holders will get their money back in pesos at an equivalent rate to the peso's current exchange rate with the dollar. In that sense, the ruling stops short of giving the savings account holders what they wanted - which was to have had the dollars they had deposited returned to them as such. As the justices also point out in their ruling, their decision is not just about returning lost savings deposits, but also about protecting property rights and helping the country find social peace. That peace has yet to fully return to the streets of Argentina some five years on from the crisis despite the economic recovery the country has enjoyed in recent years.